What happened to last week. I’m glad I described this newsletter as ‘regular’ instead of any definite time frame. 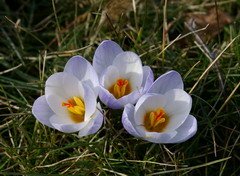 The Snowdrops are getting thicker and bigger in at least two spots in the garden and the crocus are in bloom in the grass now that the sun is out this afternoon. Even though it’s the end of March, I guess we can classify this morning’s steady downpour, at least that’s what it was doing in my part of the country, as April showers. Thankfully, we don’t have to shovel it. I must confess here, that I ignored the garden for 3 ½ days last week and enjoyed the last of winter by skiing in the Laurentians. It was a wonderful few days and now I can really hang up the skis and get into full time gardening. Before I left I did manage to get all of the Tomatoes seeded. Some 10 interesting varieties. Six different ones I chose for this year and four that I had seed leftover from last year. After I had them seeded another package arrived in the mail from Johnny’s Seeds, in Vermont, with a trial package of an eleventh variety. 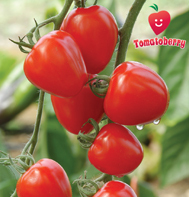 Tomatoberry is supposed to be shaped like a strawberry and be a very sweet small Tomato. I’ll go down and seed it as soon as I finish this newsletter and will keep you informed through the summer as to how it and the ten other varieties respond. Of course, I have no idea where I’m going to find room in the garden for all of these Tomato plants. There are couple of new pages about growing Tomatoes, going up on “gardening-enjoyed” today or tomorrow, that will show you how I manage to grow a lot of Tomatoes in a rather small space. If I only plant a couple of each variety I might squeeze them in. Of course I have at least twelve of each presently growing. There are also the beginnings of the recipe pages that will develop into a variety of ways to enjoy the end results of your vegetable gardens. As soon as the weather decides to cooperate, I’m anxious to get out and inspect the new bed that I created last fall. I ripped out about 20' of Hosta last fall, mostly because I needed, (my wife actually used the verb ‘wanted’) more space and all of the Hosta were of the same variety. I was going to leave the bed empty until spring and then decide what to do but !! I was in the local garden centre late in the fall and they had a huge overstock of roses that they were selling off, at less than half price and I couldn’t resist the bargain. Brought them home and planted them and now I’m anxious to see how well they fared through the winter. If at least half of them survive, and there is no reason why they shouldn’t, then I’ll be quite happy. I have another gardening dilemma. There is a long list of seeds, I should be planting now. Broccoli and Cauliflower etc. and several varieties of lettuce and many of the annual herbs such as Basil. (I’ve cut back this year, I think I only have four or five Basil varieties.) Not to mention some of the annual flowers, I decided to grow this year. If I do that I will have to trust all my little seedlings to my very reliable daughter and may have to bribe her by pointing out that many of these plants will windup in her garden as well. We are leaving the garden to help spice up this newsletter over the next couple of issues, by giving you pictures and stories about several wonderful English gardens. We will be watching Daffodils and Bluebells bloom over Easter in the south of England. My son has found a web site listing 185 public gardens in the county of Kent and we are only going for eight days. Just for the benefit of my readers, I will endeavor to visit as many as possible and report back to you. The house has the wonderful smell of spring right now. 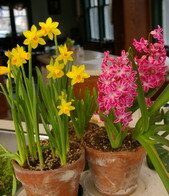 The pots of bulbs that I planted in the fall and kept cool all winter are now rewarding me. Hyacinths fill the room with their sweet perfume and the minature daffodils just sparkle and smile and anounce spring's impending arrival. It seems to me that only a real gardener can be a garden writer but just when there is a wealth of information to share with you, there is also my garden whispering its siren song in my ear. Such a dilemma.